Meet Teresa, one of our travel experts for Australia. Teresa is a Certified Tahiti Travel Specialist and works with the Tahiti Tourism Board making sure her guests enjoy a fabulous holiday in Tahiti. Teresa lives on the beautiful island of Maui, Hawaii. She's been a Travel Advisor for 20 years, specializing in tropical islands around the world but her true love is the South Pacific. Teresa has traveled throughout the South Pacific Islands and is on a first name basis with many of the resort owners. She has visited Fiji 7 times as well as Tahiti, Australia and New Zealand. Her speciality is multi-country holidays. Her agency, Luxury Hideaways, is rated A+ with the Hawaii Better Business Bureau. We have access to virtually every travel special out there. Our agents make a commission from the travel wholesalers, same as every other agent or online travel site. Why wouldn't you want a real travel expert on your side...for free? "We had the absolute best person to plan our trip for us. Her name is Teresa. She knows everything about this part of the world and took care of every little detail and it was free!!!! I highly recommend her!" "You were incredible!! I can't say enough how awesome of a job you did. I am a very deliberative person, and I was leery to a point because I didn't not have my hands in any of the scheduling/planning of the trip. So, I might have been on edge a few times until we got to the resort. I was very impressed with your service! So, thank you for all you did." "We were trying to plan our honeymoon in Fiji and were so confused and overwhelmed by the number and variety of resorts there. But then we found Teresa! She is very helpful and knowledgeable about Fiji and several different resorts there. When we were specifically trying to decide between two resorts, Teresa was able to help us decide as she provided us with specific differences between the resorts. Whenever we had questions, she responded quickly, even with the huge time difference. We are excited to have finally booked our honeymoon! She sent us a package with helpful information and tips, such as what to expect upon arrival and items to pack. We are looking forward to our honeymoon and to continue working with Teresa." "When we first started communicating with each other I wanted a Honeymoon that was going to be unforgettable and something that would be truly special, you certainly delivered plus more. Koro Sun was paradise on earth and of course we enjoyed the environment but what we loved the most was the staff and all the happy people we were surrounded by. We didn't know what to expect coming into Fiji but with all your wonderful planning and helpful notes we got through our entire Honeymoon with ease. Our Edgewater Bure was breathtaking and my wife literally had a grin from ear to ear since the moment I told her where we were going till our departure. You gave us an unbeatable capstone to our marriage and for that I can't thank you enough. Again thank you so much for helping me plan the honeymoon and it was a pleasure working with you." "Your help was AMAZING! I can not express how easy it was working with you when we were looking at different resorts and itineraries. You put so much effort into accommodating us- form budget to activities to an overall idea of what to expect in Fiji. We changed our minds several times and you were so tolerant, a real pleasure to work with. Your knowledge of the islands was a HUGE help in picking our honeymoon spot. I am not going to hesitate recommending you if any family or friends are looking to plan a vacation. Thanks again!" "Bula bula Teresa! You provided my wife and I with outstanding personalized service in preparing our trip (that due to unexpected wedding budget overruns, we were unfortunately unable to take at that time). It was so outstanding that when my friend Mike said that he was planning his honeymoon to Fiji, I told him that he MUST contact you to plan a trip. My wife and I still plan on getting to Fiji within the next 2 years, and I promise that you will be the first person that we contact for travel reservations and trip planning. " "I wanted to say again thank you this is absolutely amazing we are having a blast and the upgrade to the honeymoon bure was completely unexpected we have been treated amazingly and even got to fly to the island with the owner of the resort who was super nice to us. You were absolutely right about this place and I am so happy I found you thank you again!!!" "Thank you for the most amazing honeymoon! Wadigi was perfect in everyday! There are no words to express how incredible everything was (the food, the staff, the grounds, the accommodations...and everything in between!) We will definitely be back for our anniversary :-) Vinaka!" "Hello Teresa, Thanks for your expert help in planning out trip to Tahiti. After less than 48 hours after leaving Denver we are now at out beach bungalow at the Sofitel Hotel in Moorea Atoll. The Air Tahiti flight from LAX was less than 8 hours and the service was incredible; 2 nice meals and great service. Upon arrival in Papeete, Tahiti, we had the private car to the Ferry terminal and then a great ferry ride (30 min) to Moorea Atoll. We got here at about 10 am. Staying at the Sofitel hotel…………..what can I say: it is French and the service is impeccable. Your suggestion to spend our first few nights ‘on the beach’ was sterling………..here are pictures from out bungalow. Fortunately we got our bungalow at about 11 am and we went right into the water. We snorkeled for about 2 hours and it was the very best !!! I bought a new GoPro camera and it is a life-renewing experience to be able to film under water like this, especially in crystal clear water! Tomorrow we are on a 6 hour snorkeling tour to a ‘private island’ where we are to snorkel with manta rays and sharks.. What a hoot! So far, this is one of our very best trips ever (and we have been to 75 countries) "
"It's been more than a week since we've been back but I just wanted to let you know that we had a great time at Tahiti. Thank you for arranging our wonderful trip. My kids are already saying they wanted to go back. Teresa, I wanted to thank you for you assistance for this wonderful trip. Don't think we'll be going back to Bora Bora anytime soon, but we may seek your help for some of our future trips and cruises." "We wanted to give you a summary of our Tahiti trip. In a word, just fabulous. We have never taken such a purely luxury, relaxing type of vacation in the past and it was an absolute delight. Probably our favorite experience on the trip was the shark and manta ray feeding trip. I thought this would be somewhat hokey but it was great fun. Swimming with the sharks was a novel experience and even Debby with her limited swimming abilities had a great time. I was actually able to dive down and bat one of the lemon sharks on the tail. The mantas were like puppies in the way that they crowded around us, swimming over our shoulders in order to get to the food. We laid out the money for the video of the trip and its been the most popular picture of any trip that we have ever brought home. And we would recommend that anyone who goes to Bora Bora take the opportunity to eat at "Bloody Marys", a superb place to get the fresh seafood that we were looking for and it was very reasonably priced. I could gush further but suffice it to say that it was a fantastic trip and just the type of relaxation that we needed at this busy time in our lives. Thanks for planning a wonderful trip for us!" "Hi Teresa, Chris and I are back from our trip, and I just wanted to tell you how much we enjoyed it!! The islands were beautiful, and each hotel worked out great! Our beach bungalow at the Sofitel was the perfect location, close to the beach bar and looking directly out at the beach (#411). Just to give you some feedback, not complaining--The Sofitel was not as plush as I thought it would be and looked a little more worn. I thought the grounds would be more manicured and service a little better, considering the ranking it had. If we went back to Moorea, we would probably stay there again or recommend it to friends, because from other people that we met, it sounded like the Intercontinental there was similar and not necessarily a better option. The location was great though—near both the ferry dock and airport! The Intercontinental Bora Bora and Thalasso Spa was spectacular!! The room was very tastefully done with beautiful finishes, our hut (110) was in the perfect location, very little construction noise if any, as I think most of the exteriors are finished, and every part of the property was so upscale. The water was so beautiful, and the resort was exactly as I hoped it would be! So glad we went there last! We were able to meet up with friends from California who happened to be staying at the St Regis Bora Bora. We hadn’t seen them for over 20 years, so it was such a treat that we were all there at the same time. We didn’t realize there wasn’t a road that could easily connect both hotels, and a private water taxi would have been about $200, so we all met on the big island at Bloody Mary’s for dinner. Due to differing ferry location drop offs and times, we were only able to see each other for just over an hour, but it was great to catch up in person! All of our transfers were so easy, and we were very well taken care of during each one, whether transport, ferry or by plane! Each of the vendors made it easy to find them, and they all had our information down correctly! That was a great feature of the trip! Thanks again for all of your help with planning our vacation! We thoroughly enjoyed every minute!! Now back to reality... "
"Hi, Teresa! Never got around to telling you how great a time we had in Hawaii. You did a great job! We enjoyed every minute, even the nerve-wracking Hana Highway. It all went smoothly, without flaw, and we have taken away with us precious and unforgettable memories. Thanks again for your splendid assistance in helping us plan this vacation! " "Hello Teresa, OMG! What a fabulous trip! Where do I start? Start with: how or who do we notify so we can share what a fabulous trip you planned for us? The itinerary from start to finish was perfect! Airline tickets, all transfers both going and coming were spot on! Moorea was the perfect island for our goals; romance, culture and beauty. Manava Resort was an excellent selection. Pool, spa, beach, ocean all beautiful just sitting there waiting for us to choose. Over water bungalow was phenomenal! Excursions were reasonably priced and wonderful experiences. Oh, and Pearl Romance in town was exceptional! Mary really loved it! Thank you Thank you! Our best vacation ever! " Stunningly situated overlooking Sydney Harbour in the historic Rocks district, a short walk from the city's shopping and business centres, Four Seasons is vibrant and elegant, with dramatic harbourfront views and a luxurious day spa featuring exclusive skincare and aromatherapy treatments. Photo copyright Four Seasons Hotel Sydney. See thumbnails of all photos for this point of interest. Chic and cosmopolitan, with a dynamic sense of diversity, Sydney is one of the world's great capitals. The city was founded in 1788 when a fleet of 11 ships arrived in Australia from England with a contingent of convicts and free settlers. They came ashore at Sydney Cove, now known as Circular Quay and the site of Four Seasons Hotel Sydney. Successive waves of immigrants from many countries have had a defining influence on the culture and personality of the city, now with a population of over four million people. As a business centre, Sydney is the driving force of Australia and an important hub of the Asian-Pacific region. For recreation, the city pulses with a vibrant social scene and inspiring possibilities for outdoor adventure. Few cities of such urban sophistication can also claim 37 beautiful beaches. Legendary Bondi Beach is an easy 20-minute drive from downtown. Four Seasons is situated in the oldest and most desirable area of Sydney – the historic district of The Rocks. Lined with cobblestoned streets, the neighbourhood offers fascinating shops, a weekend market, outdoor cafés, and galleries of Aboriginal arts and crafts. Nearby, at the Royal Botanic Gardens, tropical flowers bloom in the heart of the city. The Hotel is just a short walk from major shopping and business areas, and is equally close to great museums, theatres and the Sydney Opera House. 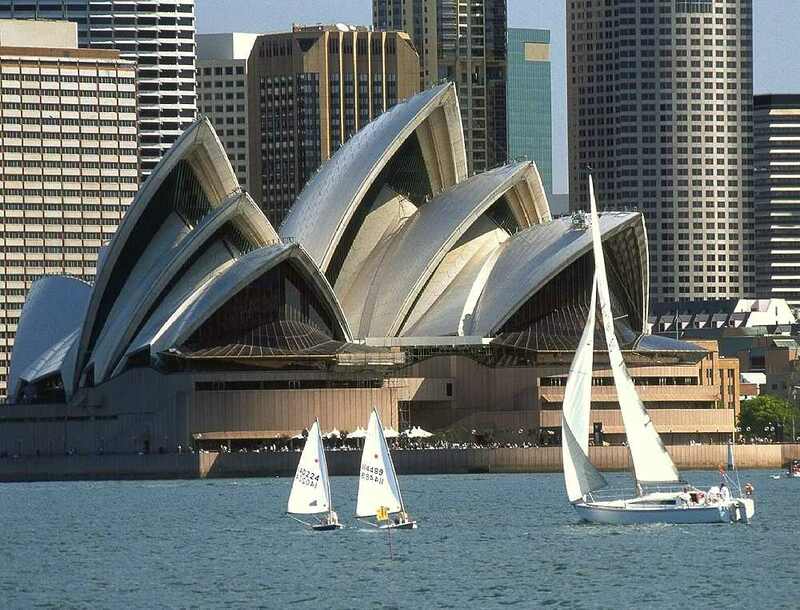 Ferries whisk you across the water to key attractions, such as Taronga Park Zoo and the renowned Sydney Aquarium. Visual Itineraries travel planning tools for travelers and travel agents. Copyright © 2010-2019 Visual Itineraries.